If you have the great fortune to visit Mauritius, you won’t want to miss dolphin spotting throughout your vacation! Why would you miss the chance of spotting Flipper and family? Cruise along the west coast for an epic sunrise and memorable dolphin encountering. Through the calm waters; you will be able to spot the dolphins peeping out in elegance, looking around for some appetizing breakfast. If luck is on your side or if they feel like it; they’ll even come and swim along your speedboat; like a little reward for waking up early to visit them! They’ll do their show; we promise! Don’t miss the thrilling experience of swimming with them too! Several companies offer breakfast when booking a dolphin cruise, usually served with love prior to your speedboat departure. Why not book an underwater photo shooting while you’re at it? If you know a little bit of French, you would already know what this is about but if not; well, just think seven waterfalls! Not one, not two but 7!! Oh yes, you got it; it isn’t just simply your typical waterfall in the middle of a lush forest! This location is one of the most outstanding natural phenomena to relish on when in Mauritius. The way to the waterfalls also promises spectacular observation points where you will be able to feast your eyes with some pretty good views of the coast of Mauritius. You’ll also be able to have a perfect shot of all 7 waterfalls at some point; but not only; as you may wish to take a dip in one of the several fresh water ponds there. What an amazing reward after a bit of hiking. You won’t want to leave this place! With dim phone signal and clear skies, 7 Cascades is the perfect place to take a step back from life and simply connect with your inner self. We highly suggest wearing some comfortable shoes and clothes (as well as a spare set). If you haven’t come across pictures of the majestic Le Morne Mountain through social media, well there’s definitely something you’re doing wrong! Le track to the summit has been opened to the public through the recent years (as from 2016 to be precised); and since then most locals have it as their ultimate profile pictures through all social media channels! It’s become that famous! Blame it on its beauty! 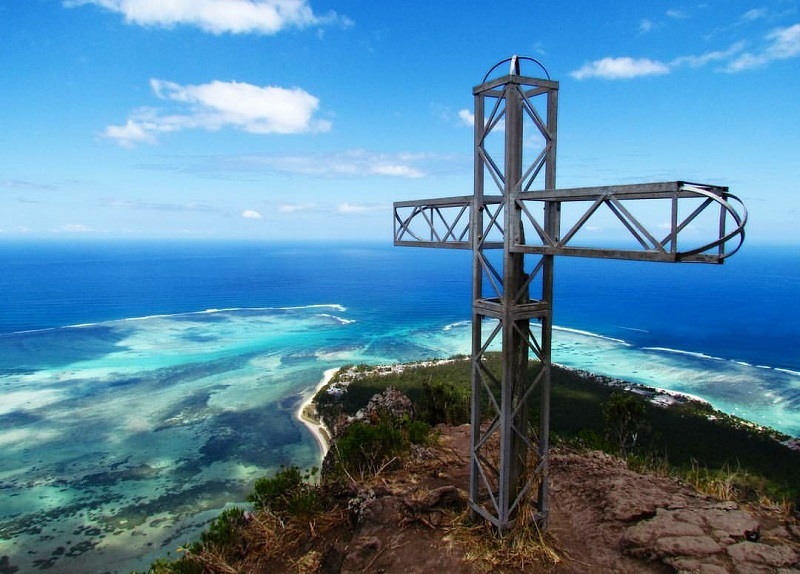 Hiking Le Morne Brabant also means you’re standing on one of the UNESCO World Heritage Site. In the past centuries, this iconic mountain used to be a refuge for the slaves and hides a tragic story behind it. We highly recommend you to read through it and learn more on the history of Mauritius and the time of slavery. Hiking at Le Morne is somehow challenging. Ofcourse you will be welcomed by some flat terrains but at some point, your hands will come in use as you will need to climb and hold on to ropes and well, you will need some good physical attributes to reach the top. However, one thing is for sure; no matter how many times you stop for a break or you fall ; you won’t regret any bit of it! The view offered once at the summit is truly magical; something completely out of this world – eye candy or even better… soul food! There is no fee to enter the UNESCO World Heritage Site but you are required to fill in the visitors book (for safety reasons). You may also wish to hire a guide once on the spot so as to get more insights on the history of the site. The whole trek will take you around 3 hours as you will stop here and there along the way to enjoy the amazing views it has to offer and take a few clicks. The view at the summit is breathtaking and there’s absolutely no word to describe it! All you have to do is hike up and see it from your own eyes! 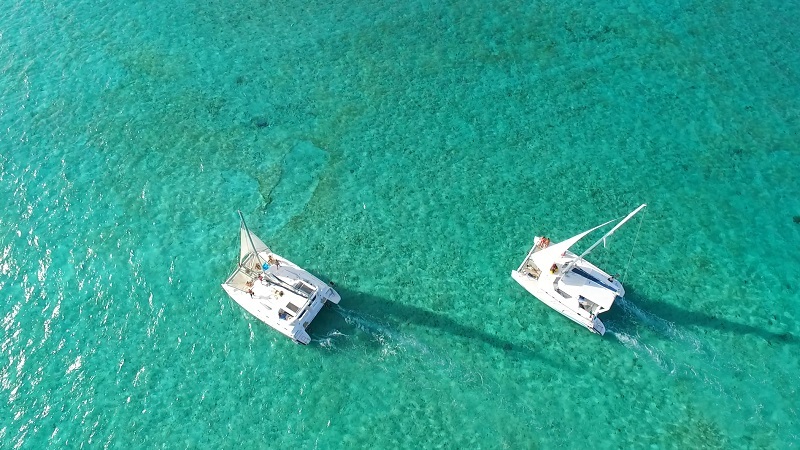 We don’t mean to say that a boat is bad quality or doesn’t sail well but nothing does it quite like a catamaran cruise to one of Mauritius’ best spots! What to do in Mauritius when you’ve seen all of the best beaches but still craving for the bluest waters? Here’s a pretty decent option you might consider to see beyond just beaches! This epic sailing adventure to Ilot Gabriel aboard the catamaran departs from Grand Bay. The sailing time to Ilot Gabriel takes about 1.5 hours; once there you will be able to relish on the azure waters and untouched surroundings. An experience that is unique on its own; it is so authentic that we like to think that the experience itself is a luxury! A catamaran cruise also means barbecue in the best spots! Who doesn’t want to have a barbecue with a turquoise sea as background? You won’t be able to find better barbecue spot, we assure you! It’s the perfect day to treat yourself and make this day a memorable one. Swimming and snorkeling are activities that can’t be missed throughout your cruise. If luck is on your side, you might also be able to spot on some dolphins and whales while sailing to Ilot Gabriel and around. Live music accompanied with light snacks is also on the schedule! Seriously, we don’t know what you’re waiting for! Grab a chance to see the ins and outs of Mauritius! Requests for special menu due to medical restrictions and others are required to be placed beforehand. 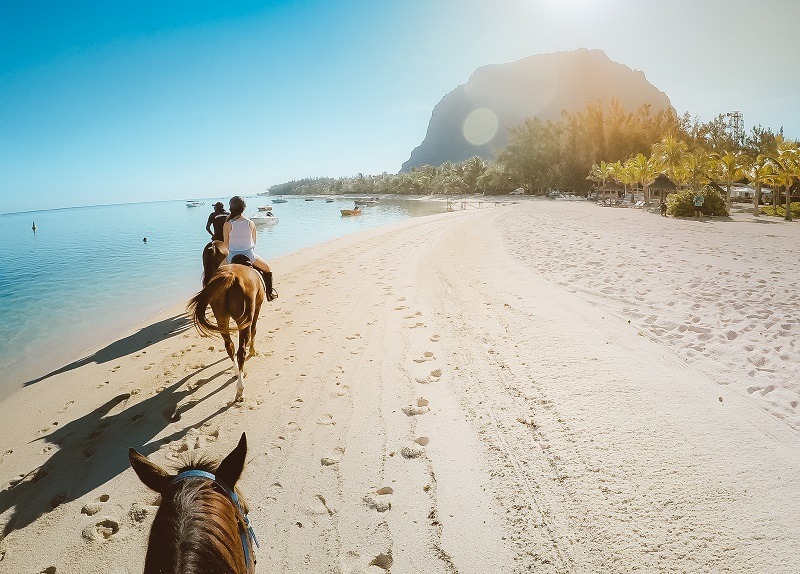 Gallop along the little gem of the South West of Mauritius and relish upon the beauty of its beach and its majestic mountain. What a unique way to discover a UNESCO World Heritage Site. Mauritius won’t stop surprising you! This is an activity that will definitely leave you in awe, stealing a piece of your heart and never giving it back! Surely not a disappointment; this activity promises amazing shots, straight out of a fairy-tale! You may choose between a whole 1 hour horseback ride by the beach or a combination of beach and mountain. Whichever you choose, we guarantee that there is no better way to enjoy sunset in such beautiful surroundings! Indeed, one of Mauritius best activities! Should you wish to ride the horse at your preferred timing, we highly encourage you to file up a special request for arrangements prior to the horse riding activity, after all horses rest too! What to do in Mauritius when you’ve seen all of the beaches; strolled around the cities and feast over some of the best gastronomy experiences? Well, we suggest a walk with lions. Yes you know, just so casual! Risk-takers, this is where you belong! Add some adventurous encounters to your vacation in Mauritius. This is the closest you’ll come to the King of the Jungle! Forget the leashes; Casela proposes a unique and ecological walk with lions where they can walk with pride and freedom in their wild habitat. The activity includes walking side by side with lions and getting to know more on their natural habitat, their behaviors and how they differ one from each other. The guides accompanying you through the walk are experienced and licensed and will take immense pleasure in telling you all of what you want to know about wildlife, based on their past experiences and background in the field. You will also be equipped with a stick along the walk along with the lion handlers and guide. Walking with lions is an exciting, yet fun activity to do in Mauritius as you get the opportunity to satisfy your adrenaline rush through this thrilling experience. It is an activity that definitely needs to be considered while on the island as after all you are in fact in Africa; and what rhymes with Africa? SAFARI! For an hour’s duration, the activity offers you great chances to get up-closed to the lions, as well as to pet them and get that cool shot for your social media feeds! Please note that private allotments for the walking activity with lions are also available on request and at additional charges. 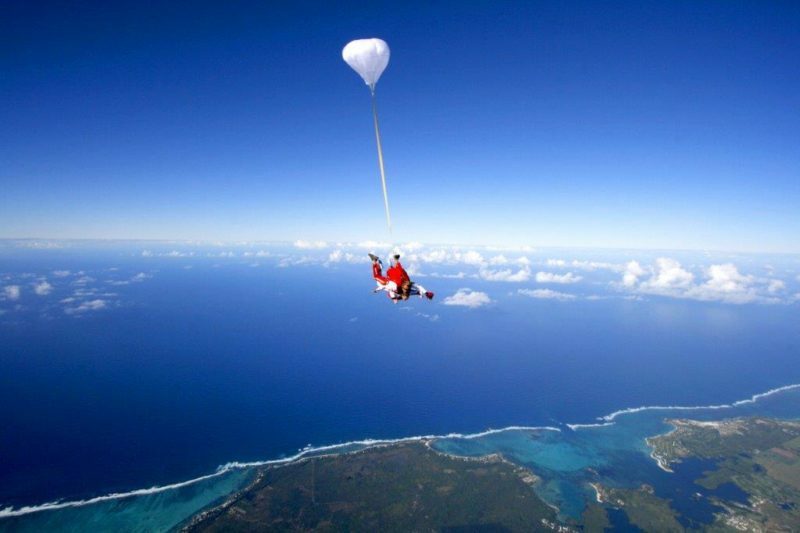 Want to witness Mauritius from above? Helicopter rides over Mauritius do not only provide you with a unique view of the island but they are also truly thrilling and entertaining. From the helicopter tours, you will be able to enjoy spectacular views of the sparkling lagoons of Mauritius, as well as other outstanding sites like the island’s famous waterfalls. Rather than swimming in or trekking through Mauritius iconic sites, a helicopter ride could be something to look out for…you know just to stand out from the crowd! There are several companies offering helicopter tours around the island’s coastal regions; which kind of make it a tough decision to make, we confess! Nevertheless, whichever you choose to go for, we promise that all helicopter sightseeing excursions available in Mauritius are surprisingly reasonable, considering their bucket-list nature and the bragging rights that tag along with them. See the astounding South West Coast from above! Seaplanes aren’t found only in the Maldives! An experience that will leave you speechless and make your eye pop with its mesmerizing views of the lagoon blues and the mountains greens! 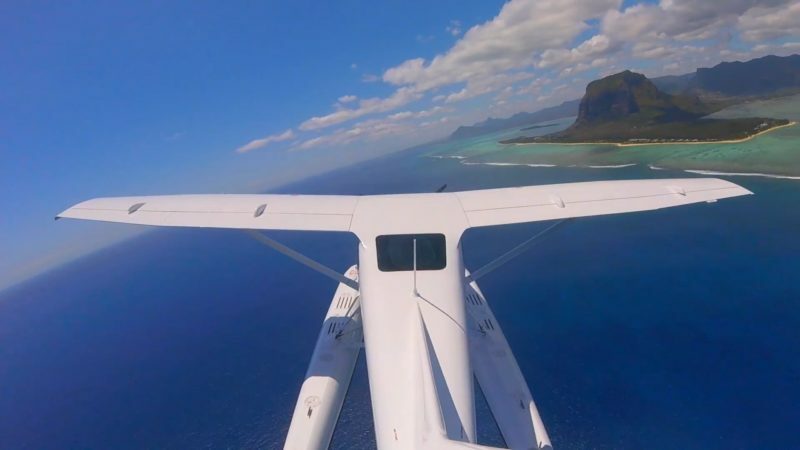 Departing from Le Morne, your seaplane flight is simply an unforgettable one. This iconic experience allows you to fly over one of the World’s most magnificent landscapes. With some luck, you might be granted to gaze upon the so-called “Underwater Waterfall” of Le Morne – a spectacular illusion which can’t be missed while in Mauritius! Smooth takeoffs are guaranteed while you soar like a bird above turquoise lagoons sparkling in the sun. The activity is ideal if you are looking for some sightseeing for the day, a unique aerial excursion suitable to all! This might sound like we’re brainwashing you to try out this experience; but actually yes we kind of are! Isn’t there something totally liberating about being away from your home soil? Away from your 9- 5 work routine? People always say “live in the moment”, “enjoy each day like it’s your last”; you know that whole “YOLO” attitude! We’re not sure anything beats the thrills you get when you throw yourself out of a plane and dive through the sky while you literally freefall. If that sounds like something you would get aroused for, well rejoice as Mauritius has a pretty decent option for you to experience such thrilling emotions! Your skydiving adventure begins with a scenic flight with incredible views to relish on. If you’re a skydiving newbie, get ready to go through a whole emotional rollercoaster! You’ll definitely have the “wake-up-in-the-morning,-hopefully-the-weather-cancels-it” phase, but before you know it you’ll get your confidence back on and be ready for this once-in-a-lifetime experience! Throughout the activity, you’ll be accompanied with an instructor who would have also detailed you the basic safety guidelines and other information prior to your “freefalling”. Fret note, controlling the parachute and all other technical stuffs aren’t on you! We highly encourage you to have a small breakfast/bite prior to this activity. Your ultimate eco-tourism adventure starts right there! 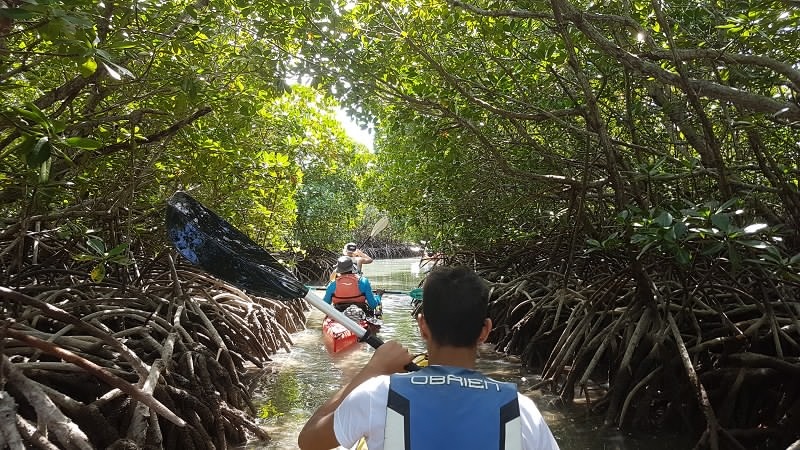 How does kayaking through untouched islets and hidden coves sound to you? This unique kayaking activity let you immerse in the most beautiful sceneries around Mauritius where peace and serenity co-exist. We highly recommend bringing a bottle of water and items that you would normally have while you are in the sun (sunscreen, hat, sunglasses). Cameras are okay, but we suggest putting them in a zipped plastic bag if they are not waterproof. 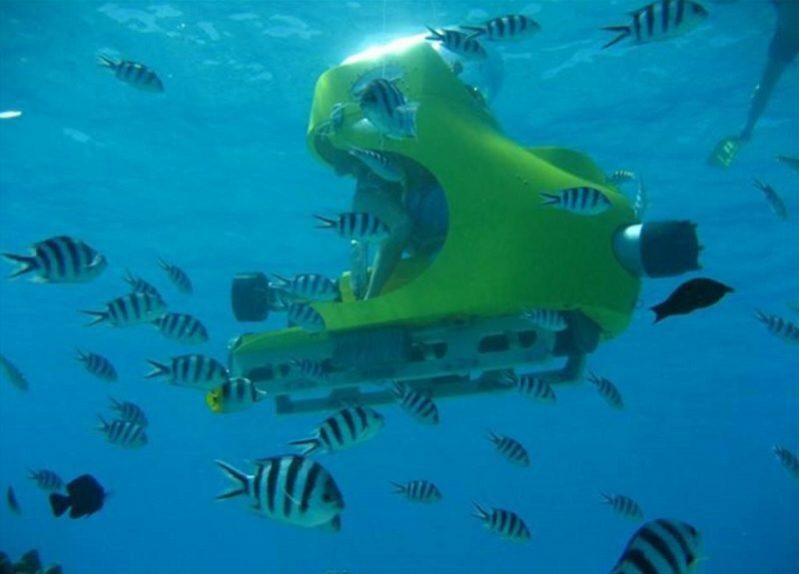 Mauritius wins it all with sea activities and this is yet another way to discover and explore the island’s underwater marine life. Forget scuba diving and snorkeling, these are too traditional for you explorers! What we propose is to ride your own submarine scooter! How exciting! After a short boat trip to the scooter platform, you will be briefed by one of the scooter experts about essential information for managing the underwater scooter. You may wish to share the underwater scooter as it is suitable for two persons, namely one pilot and one passenger. Either way, you will be amazed by the mesmerizing underwater life of Mauritius lagoons. What you can expect -> Flamboyant and countless amount of fishes, lively colorful corals and an array of other marine species (most of which you’ve never come across before)! With constant cabin- air replenishing and regeneration, the underwater scooter activity is ensured with all necessary comforts and safety. The scooter comes with an alarm system that allows you to attract the divers’ attention if required. The team will eventually guarantee your safety and make sure that this experience remains forever memorable! Choose your squad wisely! A maximum of 10 persons per group is allowed. The activity is not recommended to people suffering from respiratory problems, cardio vascular and other hearing impairments. The activity is not recommended for pregnant women. Remember when you used to careen through the playground on a swinging tire as a kid along with your little group of friends? 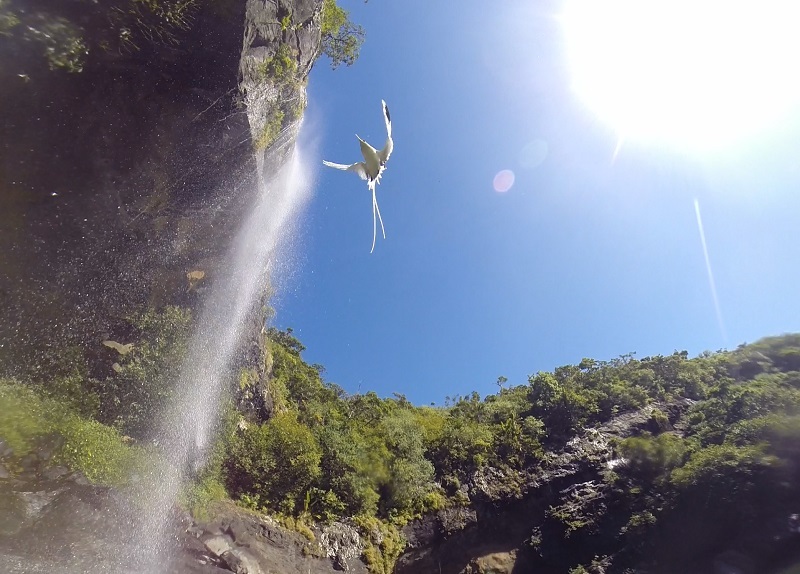 Well, zip lining has had a bit of a makeover since then- especially in Mauritius! What an exciting addition to your trip itinerary in Mauritius. 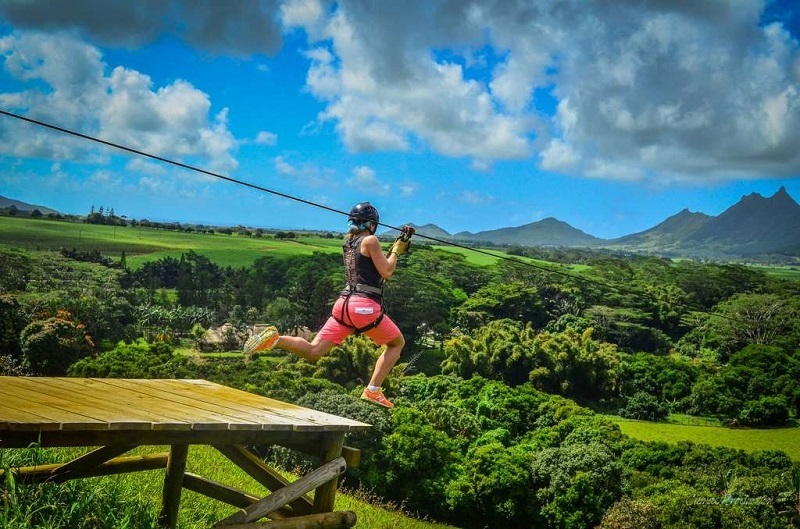 Zip lining is a memorable, once-in-a-lifetime experience to try out while you’re considering what to do in Mauritius (you know… besides beach days). The activity guarantees some of the biggest thrills while you glide your way through treetops overlooking a magnificent view of the valley. After all, it’s your chance to fly and feel like a real superhero while you shake yourself out from your daily routine. How it works: You will be strapped in harnesses and positioned sitting down before being rushed along suspended cables. An equal combination of exhilarating and excitement, zip-lining is a can’t-miss experience for those who, just like us, crave adventure. We recommend packing your action camera. We suggest wearing long and comfortable sport attires and shoes. Especially the skydiving experience is out of the world experience. It’s one among the best activities that I want to try.